易經 WHAT IS THE YIJING? The Yijing is a book with 64 chapters. Each chapter describes one hexagram. A hexagram is an image of six lines above each other, where each line consists of two short lines, or a whole line. It expresses a duality: a whole line stands for Yang and a line of two parts stands for Yin. And six of those lines make a hexagram. The Yijing describes all conceivable situations with the help of these 64 hexagrams. But that's not all. As the Yin-Yang symbol # shows that everything is always in its mutually complementary counterpart, so the lines can also change from Yin to Yang and from Yang to Yin. That is what the Yijing shows by marking a changing line: here becomes a Yin line almost Yang and here will change a Yang line to a Yin line. And those changes also make that one hexagram smoothly changes to a next hexagram. Depending on the changing lines, a hexagram can change to any other hexagram. That is why the Yijing is also called the Book of Changes. Your outer and inner world are described by the Yijing in an ongoing process of change. If you ask the Yijing a question at any time, the Yijing will show you what the situation at that moment looks like. And the book adds meaning to that. If you pose a question through this site, you will see another hexagram appear from behind the first hexagram. This is how the Yijing tells about the change in the situation. The first hexagram often says something about how it is now (which is also a bit about how you formulate the question) and the second hexagram shows how you can bring more harmony into your situation. Several texts are added to the hexagrams to help you understand the meaning. The structure of the sign is told, a 'Judgment' is given, which explains the hexagram (Confucius, 551 - 479 BC, and his followers have written comments again, which you can also read at the hexagram). And then something else is told by the image that represents the hexagram. And furthermore there are the lines, each of which has their own meaning. On this site the texts on the changing lines are shown below the two hexagrams on the answer page. But you can also read all line texts by clicking on the different red lines of the hexagram. Alle the red lines are clickable buttons. Without a computer, a question to the Yijing is often asked using 50 yarrow stalks or with three coins. Both methods are two ways to randomize six lines. These six lines together form a hexagram. The Yijing thus answers by means of a sophisticated random selection. The answer is really yours. And a computer can very well use chance in exactly the same way. This site mimics the method with the three coins very accurately. And so by clicking on the red Answer button the hexagrams are generated for you. (On this page we'll show you a bit more about the technique of random use on this site.) But there are also users of this site who prefer the method-by-hand to obtain an answer from the Yijing. They use the coins or the yarrow stalks in the manner described below by Richard Wilhelm. And then they search for the hexagrams by going either to the 'draw a hexagram' page or to the 'search for a hexagram' page. On both pages you can view the hexagrams that the Yijing has assigned you in slightly different ways. That works very well of course too. The art of consulting the Yijing is not only the art of understanding what the hexagrams themselves and the added the symbolic language means. It is also the art of questioning. Putting a closed question to the Yijing is simply less convenient (you can of course do it, if you want). The Yijing is good at giving very new insights, in an unexpected way of looking. Questions that start with: 'Do you also think that ...' seek confirmation rather than a fresh look. Try the following: Imagine facing an issue and you already have in mind how you want to address th matter. You could ask the Yijing: What do I overlook? Where is my blind spot on this subject? These kinds of questions, which thus provoke a new way of approaching, are the type of open questions that Yijing gives surprising answers to. But of course you are free to ask any question you want in any way you want. The Yijing always knows hoe to bring his (or her) message, but the more open your question is, the more open you can read the answer. This site uses the translation from Chinese by Richard Wilhelm. It is the classic translation that has the most in the West. Wilhelm has translated the old Chinese text and written an explanation for every piece of text. He did this together with an experienced Chinese Yijing master. The texts sometimes come across as old-fashioned and moralistic, but you have to look through that. This translation is still the best and that is why it is on this site. If you want to learn more about the backgrounds and use of the Yijing, please visit the site of the Yijing Research Center.. The oracle is consulted with the help of yarrow stalks. Fifty stalks are used for this purpose. One is put aside and plays no further part. The remaining 49 stalks are first divided into two heaps [at random]. Thereupon one stalk is taken from the right-hand heap and put between the ring finger and the little finger of the left hand. Then the left-hand heap is placed in the left hand, and the right hand takes from it bundles of 4, until there are 4 or fewer stalks remaining. This remainder is placed between the ring finger and the middle finger of the left hand. Next the right-hand heap is counted off by fours, and the remainder is placed between the middle finger and the forefinger of the left hand. The sum of the stalks now between the fingers of the left hand is either 9 or 5. (The various possibilities are 1 + 4 + 4, or 1 + 3 + 1, or 1 + 2 + 2, or 1 + 1 + 3; it follows that the number 5 is easier to obtain than the number 9.) At this first counting off of the stalks, the first stalk—held between the little finger and the ring finger—is disregarded as supernumerary, hence one reckons as follows: 9 = 8, or 5 = 4. The number 4 is regarded as a complete unit, to which the numerical value 3 is assigned. The number 8, on the other hand, is regarded as a double unit and is reckoned as having only the numerical value 2., Therefore, if at the first count 9 stalks are left over, they count as 2; if 5 are left, they count as 3. These stalks are now laid aside for the time being. Then the remaining stalks are gathered together again and divided anew. Once more one takes a stalk from the pile on the right and places it between the ring finger and the little finger of the left hand; then one counts off the stalks as before. This time the sum of the remainders is either 8 or 4, the possible combinations being 1 + 4 + 3, or 1 + 3 + 4, or 1 + 1 + 2, or 1 + 2 + 1, so that this time the chances of obtaining 8 or 4 are equal. The 8 counts as 2, the 4 counts as 3. If the sum is 5 (= 4, value 3) + 4 (value 3) + 4 (value 3), the resulting numerical value is 9, the so-called old yang. This becomes a positive line that moves and must therefore be taken into account in the interpretation of the individual lines. It is designated by the symbol . If the sum of the composite remainders is 9 (= 8, value 2) + 8 (value 2) + 8 (value 2), the final value is 6, the so-called old yin. This becomes a negative line that moves and is therefore to be taken into account in the interpretation of the individual lines. It is designated by the symbol . the value 7 results, the so-called young yang. This becomes a positive line that is at rest and therefore not taken into account in the interpretation of the individual lines. It is designated by the symbol . 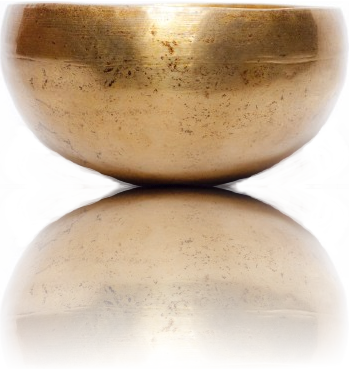 the value 8 results, the so-called young yin. This becomes a negative line that is at rest and therefore not taken into account in the interpretation of the individual lines. It is designated by the symbol . This procedure is repeated six times, and thus a hexagram of six stages is built up. When a hexagram consists entirely of non-moving lines, the oracle takes into account only the idea represented by the hexagram as a whole, as set down in the Judgment by King Wen and in the Commentary on the Decision by Confucius, together with the Image. Thus hexagram 56 would be the starting point of a development leading, by reason of the situation of the nine in the fourth place and the appended counsel, to the final situation, i.e., hexagram 52. 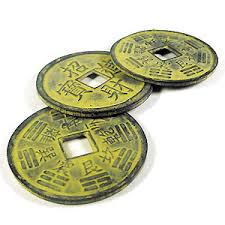 In addition to the method of the yarrow-stalk oracle, there is in use a shorter method employing coins: for this as a rule old Chinese bronze coins , with a hole in the middle and an inscription on one side, are used. Three coins are taken up and thrown down together, and each throw gives a line. The inscribed side counts as yin, with the value 2, and the reverse side counts as yang, with the value 3. From this the character of the line is derived. If all three coins are yang, the line is a 9; if all three are yin, it is a 6. 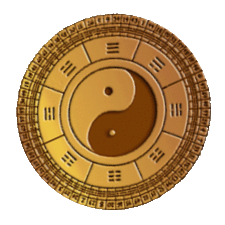 There is yet another kind of coin oracle, employing, besides the hexagrams of the Yijing, the “five stages of change,” the cyclic signs, etc. This oracle is used by Chinese soothsayers, but without the text of the hexagrams of the Yijing. It is said to be a perpetuation of the ancient tortoise oracle, which was consulted in antiquity in addition to the yarrow-stalk oracle. In the course of time it was gradually supplanted by the Yijing, in the more rational form imparted to it by Confucius.